The scores were 116-110, 115-111 and 114-112. It was a hard fight to score due to all the head-butts and rabbit punches being thrown by Mikaelian. Boxing News 24 scored it for Mikaelian 8 rounds to 4. He looked to be the better fighter of the two, and he was landing the better shots throughout the contest. The referee took a point away from Briedis without warning for hitting Mikaelian to the head in the 10th when he had him in a head-lock. It looked like a petty call on the referee’s part, as it wasn’t a hard punch from Briedis. 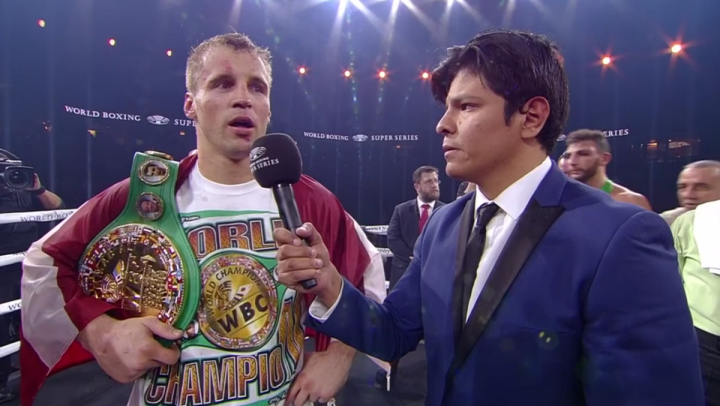 Briedis struggled with the 6’3″ height, long reach and the faster hands of Mikaelian throughout the fight. Instead of Briedis getting in close to land his shots, he stayed on the outside until the 11th, and he took a lot of shots. It wasn’t until the 11th round where Briedis finally figured out that he needed to stay in close to land his shots and rough up Mikaelian. Unfortunately for Briedis, Mikaelian would frequently grab him in a clinch each time he would try and land on the inside. It was messy. When the two would clinch, there was often punches thrown while they were holding each other. In round four, Mikaelian had a point deducted by the referee Jose Guadalupe Garcia for a blatant rabbit punch thrown to the back of the head. A round earlier, Mikaelian, 28, had hit Briedis with a punch to the back of the head. The referee gave Mikaelian a stern warning at that time. Mikaelian had been punching Briedis to the back of the head from the 1st round, and Mikaelian continued to hit him in the back of the head from time to time for the remainder of the fight. “This fight for me in the tournament is the toughest of the tournament,” Breiedis said. “I fightthe guy that wins this fight,” Briedis said about the quarterfinal fight in the World Boxing Super Series between Maxium Vlasov and Krzystof Glowacki in the main event. Mikaelian suffered a cut over his right eye in the 10th round from a clash of heads. It was a wide cut, but his corner did a great job of patching it up. The way that Briedis looked tonight, it’s going to be hard for him to beat the winner of tonight’s Glowacki vs. Vlasov fight, but you never know. The 33-year-old Briedis looks like he’s lost from his game in the last two years. He’s no longer as accurate as he used to be with his shots, and he does a lot of holding and mauling. He didn’t used to do that.